Cheap character LCD displays are more versatile than we give them credit for. Most of the cheapies have a 5×8 character display, which looks blocky but legible when you have an appropriate font. Where it gets fun is that most of the LCD displays also let you upload custom characters. Taking this to the extreme, [numeric] abused the user-defined characters to write a tiny game of Tetris that would run in the 10×16 frame that you get when you combine four characters together. It’s tiny, it’s monochrome, and doesn’t play the Troika theme (which may be a good thing), but it’s playable. Check out the video below. The HD44780 LCD controller is the defacto way of adding a small text display to your next project. If you need a way to display a few variables, a few lines of text, or adding a small user interface to a project, odds are you’ll be using one of these parallel LCDs. 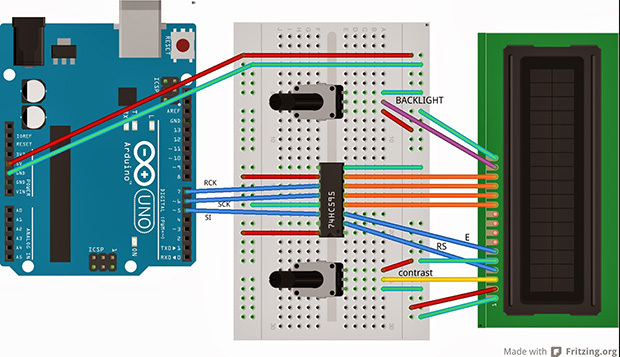 These displays require at least six control lines, and if you’re using a small microcontroller or are down to your last pins, you might want to think about controlling an LCD with a shift register. [Matteo] used the ubiquitous ‘595 shift register configured as a serial to parallel converter to drive his LCD. Driving the LCD this way requires only three pins on the Arduino, [Matteo]’s microcontroller of choice. For the software, [Matteo] modified the stock Arduino LiquidCrystal library and put it up on his Git. Most of the functions are left untouched, but for this build the LCD can only be used in its four bit mode. 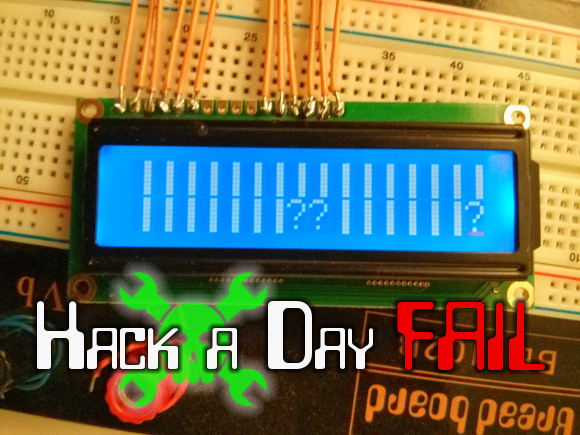 That’s not a problem for 99% of the time, but if you need custom characters on your LCD you can always connect another shift register. If you just can’t spare three pins for a display, you could squeeze this down to just two, or add a second microcontroller for a one-wire-like interface.